One of the most difficult feats is getting prospects to commit to a sales call with a member of your team. It’s tough to pin down a mutually convenient appointment time, and even tougher to connect with the prospect at the right moment when your company and services are top of mind. HubSpot Meetings can help. HubSpot Meetings is a tool that allows your lead to schedule an appointment with convenience and ease. The tool presents prospects with a rundown on your availability, allowing them to choose a date and time that works best for them. They simply click on their desired option, and the meeting is added to your calendar. HubSpot Meetings integrates with Google and Office 365 calendars, ensuring your availability is always up to date. Once the tool is set up, you can embed meeting links on your website, emails or other areas where prospects are most likely to schedule appointments while their interest is high. In addition to reaching prospects when they’re most likely to schedule an appointment, HubSpot Meetings comes with multiple benefits that make it an ideal sales enablement tool. Simple booking process: All the prospect has to do is review the available schedule and then click the time they want to meet. They automatically receive an emailed invitation with the details as well as reminder emails prior to the appointment. No back and forth scheduling a time: The tool eliminates the back-and-forth emails you formerly had to send to find a mutually convenient appointment time, making it far less annoying for your lead. More flexibility and power for prospects: Not only can prospects pick the time that works best for them, but advanced versions of HubSpot Meetings lets you set up meeting links that allow prospects to select the specific sales rep with whom they’d like to meet. Contact record creation: When a prospect schedules a meeting, HubSpot automatically adds the person’s contact information to your database. You can then add the person to future nurturing campaigns and other correspondence as desired. Multiple calendar integration: HubSpot Meetings integrates with Google and Office 365 calendars, which means it updates information from Gmail, G Suite, Outlook and Office 365. Whenever your availability changes on any one of your integrated calendars, HubSpot Meetings syncs to keep your schedule current. Highly customizable design and features: If you’re using HubSpot Meetings as a Sales Starter or Sales Pro customer, you’ll enjoy additional functions not included in the free version of the meetings tool. These include multiple calendar links, team calendars, additional form fields and the ability to remove HubSpot branding. HubSpot Meetings can be found in the Sales category of your HubSpot dashboard. Click on the Meetings option in the Sales drop-down menu to access the settings, which consist of a series of four different sections. In this section, you can edit the meeting name and length. You can also add a photo of yourself, which adds a face to your name while making the form relevant to the person booking the meeting. You can also set appointment reminder emails in this section, which are enabled by checking the option on the screen. You can include details form your invitation in the reminder, as well as schedule when you would like the reminder emails to be sent. 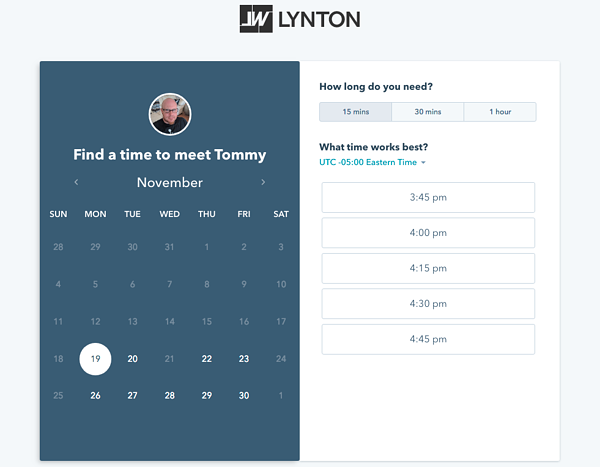 The next section lets you add more details, such as location and details for the meeting invitation which will be sent when a person books a meeting. Personalization tokens are also available here. Add the contact token to include the prospect’s name in the meeting title. You can also add company name if desired. Set your default availability, indicating which days and time typically work for your appointments. The availability setting area is where you’ll choose your time zone, as well as drag-and-drop to select your availability throughout a standard week. Note that events scheduled in your Google or Office 365 calendar will supersede your default availability in HubSpot Meetings. Set the required fields for your scheduling form, based on the information you want to capture from the prospect scheduling an appointment. The most straightforward form could include name, email and phone number, or you can set the form to include additional fields as desired. Save your changes once you’ve gone through all four sections, and then test the meeting link to ensure it works. You can have this sales enablement tool set up and ready for action in about 15 minutes. HubSpot Meetings not only saves you time and hassles that usually come with trying to set up an appointment, but it strikes when prospects are most likely to respond. This makes it an essential sales enablement tool to have at your disposal, one that both you and your prospects will enjoy.